Glorious Goodwood racegoers will be able to see some of the best up-and-coming fillies in the businesses vying for glory in a new race at the festival – but blink and you might miss it. The news comes as bosses unveil changes to the flow of the Qatar Goodwood Festival that will also see two popular contest switch days. The new race is a five-furlong dash for two-year-old fillies and will be staged on the same day as the £1m Qatar Sussex Stakes. Clerk of the course Ed Arkell revealed the minor twekas and the addition of the new contest were coming in under a constant review of Qatar Festival week and how to keep it fresh. Arkell said: “The Lillie Langtry (Group 2 race for fillies and mares aged three or older) moves from Thursday to Saturday as the feature pattern race on the Saturday. “And the Gordon Stakes (Group 3 race for three-year-olds) drops into the Lillie Langtry’s slot on the Thursday, which of course is Ladies’ Day. “Hopefully that will encourage a few more runners, potentially some international ones. 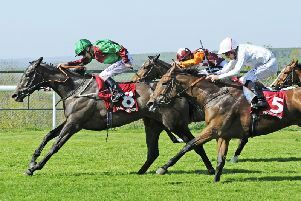 “We have a new five-furlong race for two-year-old fillies, a race we’d like to see develop, filling the gap between the Queen Mary at Royal Ascot and the St Hughs Stakes at Newbury. “That will be run on the Wednesday, Sussex Stakes day. “We look at the flow of the week every year. Goodwood sport managing director Adam Waterworth said: “We’ve always tweaked things. We’ve always been keen that you don’t get dead-set that a race has to be on a particular day because it always has been and shall be forever more. Some meetings do get a bit like that. “Ed Arkell will always have a conversation with all the trainers and owners at the end of the week. “You need approval to move pattern races. “We are not the holders of all knowledge so the trainers might spot something that we don’t. The Observer revealed last week that Goodwood bosses were stepping up their bid to attract runners from overseas. Australia, the United States, Japan and Hong Kong are all on their radar as they try to woo connections of leading foreign horses.